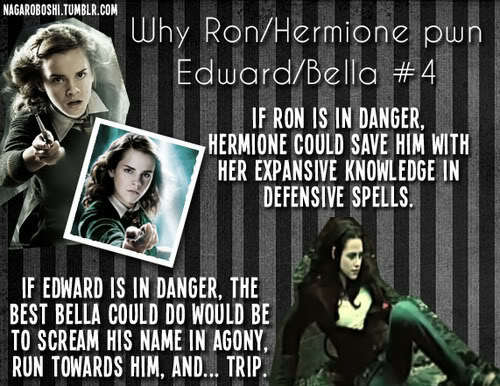 why Ron/Hermione pwn Bella/Edward. . Wallpaper and background images in the harry potter vs crepúsculo club tagged: twilight edward cullen funny bella swan harry potter twilight series. This harry potter vs crepúsculo fan art might contain signo, cartel, texto, pizarra, letrero, animado, cómic, manga, historieta, anime, and dibujos animados. On the other hand, Edward can fight of a vampire without having even a scratch and fight side-to-side with his, so called, enemie, while all Ron can do is ask for Hermione to save him. These are just repeats from months ago, so I'm not even going to reply anything besides this. Bella can't defend Edward ?How about helping him killing Victoria in Eclipse ?Or how about Breaking Dawn ? I love 'run towards him and...trip'. It' s just so melodramatic. Lol!